The Boolean variable type is probably the easiest type of variable. It doesn’t have a “maximum range”, it can’t produce “overflow” exceptions, it’s not affected by precision, etc. 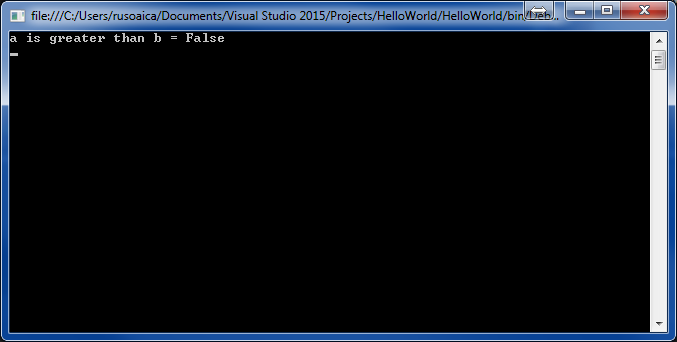 In fact, Boolean variable type can only have two values: true or false. They are almost exclusively used for calculations of logical expressions. They are declared using the keyword bool. // Which one is greater? 1. 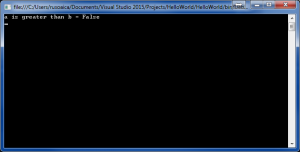 Declare a variable isFemale of type bool and assign a value to it depending on your gender. This entry was posted on Thursday, December 29th, 2016 at 06:19 and is filed under Introduction. You can follow any responses to this entry through the RSS 2.0 feed. You can skip to the end and leave a response. Pinging is currently not allowed. Posts (RSS) and Comments (RSS). 510 interogations. 0.487 seconds.